Being a landscape photographer is far from easy, but the payoff can be great. It has been my experience that exposure to the elements is the number one killer of equipment. Far away in the great outdoors where if gear fails, it can mean absolute disaster, and ultimately a waste of a trip. There are two things that matter the most to me in regards to my gear: reliability and weight. There is only one piece of equipment that covers both perfectly and that is my Mefoto RoadTrip. Weighing in at under 4lbs, it’s hardly noticeable when paired with the rest of my gear. After a lot of heavy abuse being submerged in saltwater, the extreme cold of the Sierra Nevada or the dry Mojave desert in 117 degree heat, it has yet to fail me. I now understand why Mefoto offers a 5 year warranty… because you will never need to use it. With a price point below $200, nothing else on the market can touch this value for the money. It has held up better and longer than a few of my other brand tripods that cost at least twice as much and now are collecting dust. Additionally, it’s nice to have gear that is versatile and can play more than one part. With height extension options that can be just inches off the ground for that perfect low-level foreground depth all the way up to an eye level, expansive feeling shot (and with me standing at 6'1 that’s not easy for a tripod), it covers all the bases. The collapsible leg extensions hold firm and the hook on the base plate cap allows me to hang my bag while adding stability if needed. Another great feature is the monopod leg option, which is a great tool to have on the ready when hiking through the backcountry. It's not often that I find a product that I will stand behind proudly as I am generally not "brand loyal", but this thing redefines the word reliable. As they say, "the proof is in the pudding"… and I have found my favorite flavor. When packing for a shoot or scouting a new location I have the peace of mind that my Roadtrip will hold up to what ever I throw at it next. Thanks MeFOTO, I can't wait for the next adventure to begin! The National Cherry Blossom Festival held every April commemorates the 1912 gift of 3,000 cherry trees from Mayor Yukio Ozaki of Tokyo to the city of Washington, DC. Over the years, the festival has grown into the nation's largest springtime celebration with over 5 weeks of events and activities during the blooming period. Norman Rea, our SideKick360 winner for May 16th, was one of over 1.5 million visitors to enjoy the spectacular blooms this year. I am always looking for new ways to stabilize my gear when out cruising the planet. Recently, I stumbled across some colorful goodness from a company called MeFOTO. As many may know, I am into everything colorful. This company catered perfectly to me in that department, so I arranged to get some in my hands here on island in Hawaii. I, of course, ordered a hot pink SideKick360, a hot pink RoadTrip tripod, and a hot pink Walkabout, so you know exactly what I’m rocking. I was excited to receive them simply to see the color, hoping the pink would be a nice pink that I would gravitate towards as opposed to a NOT so nice pink… I opened the box and to my surprise, it was a perfect, awesomely vibrant, hot pink that looks very cool! Totally stoked, so all good so far! Let’s start out with the tripod….this is the RoadTrip. This tripod works well for anything really….iPhones, small point and shoot cameras, and DSLRs. It's compact and fits nicely in the provided carrying case. Folded, the RoadTrip's only 15.4”, yet extends to over 61.6” which is good enough for most styles and types of shooting. If you need more, MeFOTO offers another option called the GlobeTrotter which extends another 3 inches give or take. I personally am confident with either of these two tripods. The main reason I was interested in these in the first place (Other than the pink, of course!) was for the MeFOTO product called the SideKick360. This is a smartphone adapter for tripods that safely holds your phone…in my case, my iPhone5S. The SideKick360 holds the phone safely and securely while articulating and rotating easily for fine tuning and precise adjustments. It's perfect for making sure the horizon is level when shooting videos and landscapes or time lapses here in Hawaii, which I do daily. People always ask me for tips and suggestions and I tell them always having the ability to stabilize your cameras or phone is crucial to taking quality images, video, or time lapse videos. This solves that issue with style, color, and precision control and is, hands down, the best mount I have used to date for my iPhone. The SideKick360 mounts perfectly into the the tripods MeFOTO carries with an Arca Swiss style mount and is the perfect turn key package for your iPhone photography or photography in general. For under $300, you can be styling and shooting any scene with zero worries or concerns about camera shake and blurred images. All of the MeFOTO product line comes in a variety of colors….twelve to be exact, so there is literally something for everyone in regards to personal flare with your camera gear. One last product I had to go for was a hot pink WalkAbout. Being in Hawaii and traveling to other countries, I hike a lot and walk a lot and knew this would work not only as a monopod, but also as a handy, colorful walking stick which MeFOTO actually suggests in their product description. It has a handle compass on the top too! The WalkAbout measures 18.1” in length when compacted and extends to a length of over 5 feet which is good enough for me. It’s really light too which is nice. The compass knob that you use for the walking stick portion of it unscrews to reveal the threading for your camera when using it as a monopod. It’s perfect for me and my hiking adventures giving me another option when on the trails. To wrap this up, I would highly recommend MeFOTO products as a colorful and affordable quality option for those looking to invest in ways to improve on and stabilize their creative process while using their devices and cameras. I have mine with me everywhere I go and don’t leave home without it. Aloha! Anthony Tortoriello is a Chicago-based commercial photographer who enjoys working in Costa Rica and Hawaii as he explores themes of biodiversity and our changing planet while documenting lava flows, jungle flora and fauna and some of the biggest surf in Hawaii. Anthony is committed to bringing people the niches that remain inaccessible to most. Who says you have to use pro gear to get a great shot? Jeff Picoult, BackPacker winner for 2/21/14, proves the best camera is the one you have with you - even if it's a phone! "I am a volunteer photographer for the Summit Metro Parks in Summit County, Ohio. One of the parks I like to photograph each spring is Furnace Run Metro Park which features a 0.6 mile hiking path called Daffodil Trail. There are estimated to be more than 40,000 daffodils in over a dozen varieties along the trail during peak bloom in late April to early May. This photo was captured during the peak bloom of 2013 just after an early morning shower passed over the park. The weight of the water on the daffodils caused most of them to point downward making for a less than desirable photographic opportunity. Then, as luck would have it, the sky began to clear allowing rays of sun to shine down on some of the flowers. Luckily, this particular daffodil was not covered in mud from the splashing raindrops. Instead it's white petals seemed to glisten in its tiny bit of sunlight. The dark canopy of leaves from surrounding plants and trees created the perfect backdrop to show off this beautiful flower! No better start to a day than a gorgeous sunrise! But it takes a special kind of dedication to get up and out in time to get the shot. 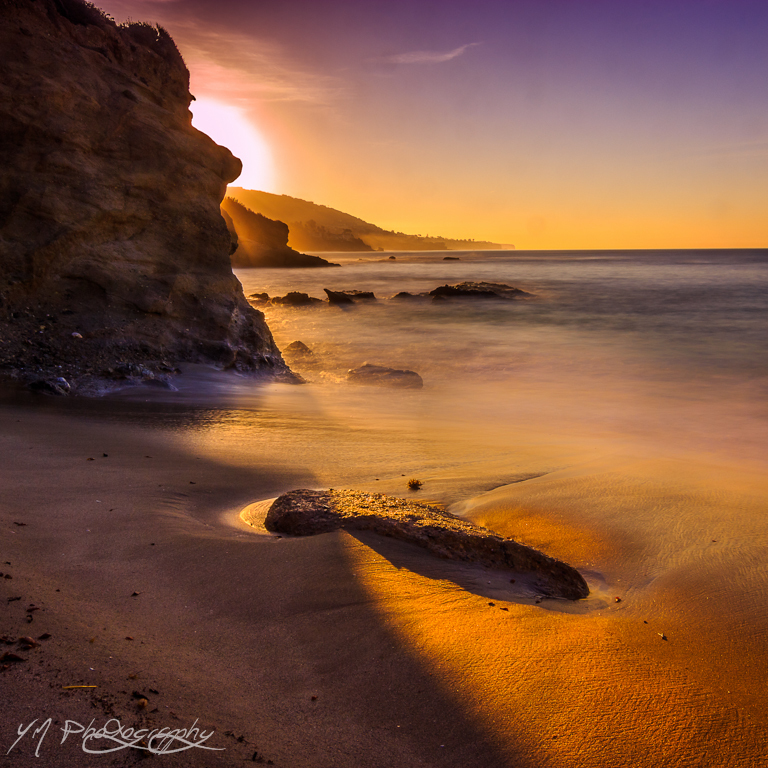 Yemel Martinez, 2104's first Giveaway winner, shows his commitment to photography and love of light with this shot taken just as the sun was rising in Laguna Beach, CA. Getting great sunrise shots can be a bit tricky. If you're just starting out and want to make the most of your early day or if you're looking for tips to improve your sunrise shots, professional photographer, Rick Sammon, gives a great overview in this video. You can see more of Yemel's work here.